This traditional Chinese stewed dish is very delicious. 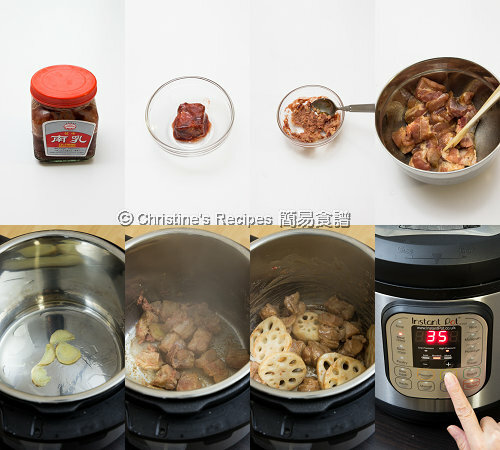 The pork ribs and lotus roots are cooked until very tender. They absorb all the flavours of red bean curd paste. This dish goes very well with a bowl of steamed rice. Lotus roots are often used in Chinese cooking. They are so good for making stew dishes. Fresh lotus roots are not easily found in Australia. Yet it’s very popular and easy to find around southern and eastern Asia. I happened to spot some frozen lotus roots sold at a nearby Asian grocer. They are already cleaned, peeled and sliced, thus very handy to be used. The good thing is that the price is much cheaper than the fresh ones. You must’ve got what my next action was after spotting some frozen lotus roots accidentally. Yes, I bought a packet back home to try. 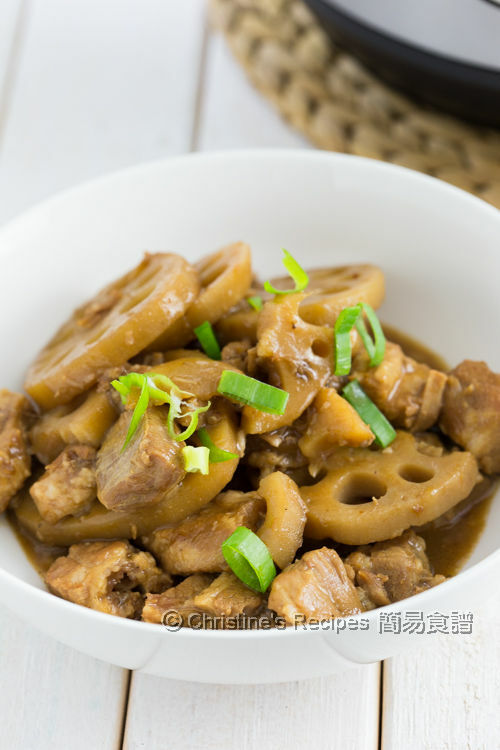 This braised pork ribs with lotus root is a traditional Chinese dish that I tried many years ago in Hong Kong. It's often slow-cooked on stove. The taste is so scrumptious. My Instant Pot did a very good job for me. It helped me cut short the cooking time a lot. Both of the pork ribs and lotus root were wonderfully tender, and absorbed all the tasty sauce. For those who don’t have an Instant Pot, I also inserted the stove-top instructions below. The red bean curd adds so much flavours into the whole dish. Cut the ribs into 4 to 5-cm (1½ to 2-inch) chunks. Mix with marinade well. Set aside for 20 minutes. Prepare Instant Pot. Select “Saute” - normal. Heat oil. Sauté the ginger and red bean curd paste. Beware not to burn it though. Add pork ribs. Quickly stir to combine. Add lotus root. Pour in the water. Cover the lid with “sealing” on. Select “Meat/Stew”. Cook for 35 minutes. Quick release pressure. Turn handle to “Venting”. After the valve drops, Remove the lid. Select “Saute”. Stir in the thickening. Cook to your preferred consistency. Sever hot. Enjoy! Follow the above instructions to prepare all the ingredients. Heat oil in a heavy-based deep pot over medium heat. Saute ginger and red bean curd paste. Add pork ribs and lotus root. Stir to combine. Pour in 3 cups of water. Bring it to boil. Then simmer until the pork ribs becomes softened. Stir in the thickening. Cook to preferred consistency. Serve hot. Enjoy! 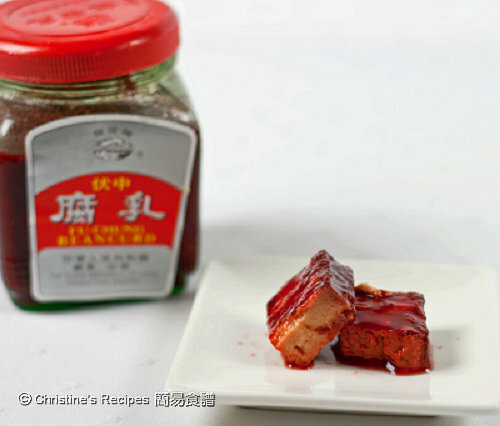 Red bean curd is a type of preserved bean curd (also called fermented bean curd), and often used in making stews and braised meat dishes, like Braised Vegetables with Red Fermented Beancurd (南乳炆齋) Spicy Beancurb Pork Rib Stew and Chicken Wings with Red-Fermented Beancurd. Red bean curd is available at Asian grocers. Your recipe caught my eyes. 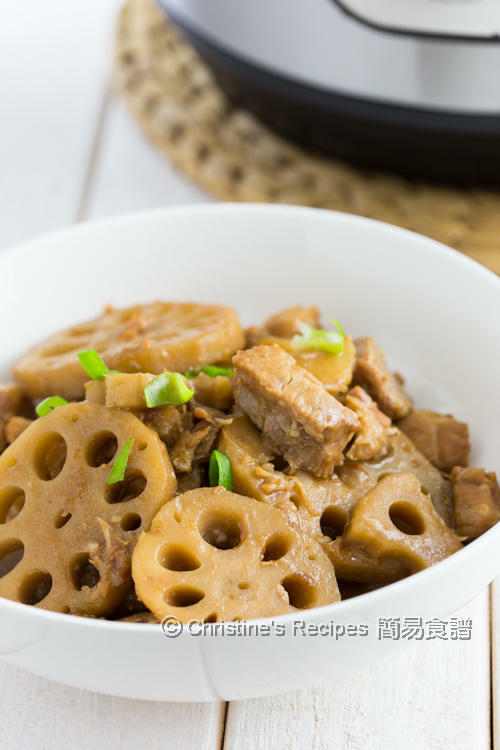 I like pork ribs and adding lotus root sounds like an interesting combo. My question, how thick to cut the lotus root? Hi, thanks for your love of this recipe and sharing. The meat size is also crucial to determine the cooking time.